NV HMI by Omron PLC is available in three different models , it is a superior HMI by Omron. Omron says that "V" stands for Value , Visibility and Variation. As a compact HMI it is the best for Package PLC. It has RS485 Communication feature and we will see in detail the procedure for MODBUS Communication of NV HMI with Omron PLC. We have already told the NP5 HMI Modbus Communication and the basic PLC Program for Modbus Communication in our earlier post. To set up the Modbus in NV HMI first of all we have to make the hard-wire connections. Connect the Omron CP1W-CIF11 at Omron PLC CP1E and do the Settings in the CP1W-CIF11 for MODBUS Communication. Also short the terminals 7 (-RD) and 8 (E) with terminal 5(-SD).Also connect the terminal with terminal 4 on the NV HMI side. All the dip switch should be off for MODBUS Communication. Omron CX-one software package comes with NV-Designer Software which is used for Designing Screens in NV HMI. After the Hardware connections we have to make some proper settings in the HMI software also . Open the NV-Designer and select a New Project , select the proper NV Type and NV Model and the click next , Here we have to select PLC Model as " Modbus Slave (RTU Mode)and click next and choose System Memory area Word and Bits. See the below picture for a better Understanding of settings. Click on the above picture for a better enlarged view. Also we have to set up the Node ID of NV HMI and Communication Parameters. To do this click on PT --- NV Configuration and select the NODE ID and other parameters accordingly. 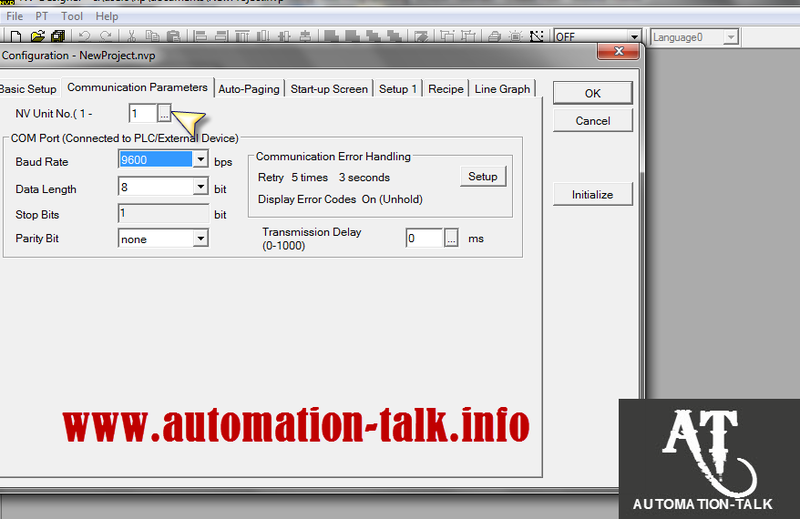 Note :- The configuration of Communication Parameters should be same at both PLC side and HMI Side. Now our settings are done and we have successfully done the proper Hardware and Software settings for MODBUS Communication in NV HMI with Omron PLC CP1E. As we all know that in MODBUS all the communication takes place in the form of Queries and Responses. For this we have to write the PLC Program accordingly. here :- 01 is Node ID, 10 is Function Code for Write , B is number of Bytes , 01 means that we want one register to write. Note :- As in MODBUS we need to subtract 1 from the address , there is no need to do it in NV HMI , it does automatically. 0001--------0003----------0004---------Address----------Number of Bytes to Read. here 03 is the function code for Read in MODBUS. This way you will be able to establish MODBUS Communication between NV HMI and Omron PLC or any other PLC. Remember :- NV HMI uses its internal Registers for MODBUS Communication, so put the address accordingly. GDT for words and GR for Bits. If you are facing any problem in NV HMI Modbus Communication , then please write in Comment section and we wil get back to you . Also you can subscribe to get all latest update in PLC Programming ,MODBUS Programming , VFD Installation, SCADA Scripts. i want to write plc program in cp1e for communicating seimens v20 vfd on modbus please suggest me.